CDO Forums / Hobby / Modeling Ideas and Advice / CD themed Black Orcs? Author MessageCD themed Black Orcs? Well I've got myself the regiment of 20, so off to a good start! I'll give them scalemail over the chaimail, maybe doing a few weapon swaps here and there. Should I do some detail work over most of the armour? Its an interesting idea, as they would have made the armour to Orcish tastes, but with their own style stamped on it. So I feel I should do something in places as it's very bare, but what? Daemonic orc faces? Chaos arrows? Or perhaps some fancy knotwork (lots of work though)? Or stay away from all that and add things attached to the armour instead? Like chains holding skulls on/ money bags/ loads of spikes/ extra armour plates etc? I did have thoughts to theme them also to hate Dwarfs, so beard plaits etc and dwarf armour plates? Or would that all be too much? The possibilities are endless, and that�s before I even think about the bases. I'll put up a WIP shot of the first one so I can decide the theme before starting on the rest. This post was last modified: 08-23-2007 12:58 PM by Xander. I imagine the Chaos Dwarf theme should not be too obvious, as the Black Orcs would only show loyalty for hard coin to their creators and former slavers. They would not have things like the rune of Hashut or bull motifs on their armour. You could add curly beards to the skulls on their shields here and there, though. I also like your idea of adding scalemail to fit them into the Chaos Dwarf theme. I would give them as little armour as possible. Perhaps a little bit of plating here and there. Well here's what I've done so far.��I added the rune of hashut, but I focused mainly on lightning.��I made the helmet a bit meaner as well. The trick is going to be painting it like its a black orc, so no bright colours and keep it dark. This post was last modified: 05-27-2007 08:42 AM by Grimstonefire. I like this, nice and understated. Lets not forget that the black orcs and their armour were made by the chaos dwarfs anyway, so they shouldn't look too different. Maybe this unit has been given better kit for serving the chaos dwarfs. Agree with fur cloak. It would look like thet they are more trusted and intellegent then the comon orcs.The scale mail went great but sadly i don't see any Hashut simbols where did you skulpted them? That looks really cool Grim, I'd love to know how sculpt that scale-mail so flawlessly. Yes, your scale mail rocks! Well done sir! I think I'll keep the orc glyps as they would orcify anything they're given.��That and it saves a lot of time. I love these dwarf ideas, I've added a dwarf shield onto the base of this one, maybe some axes/ beard plaits onto others.��I want to try and give a blunderbuss to one as well, a few pistols and big hammers where possible. I think instead of doing loads of freehand designs on the large sections of armour I will just do raised rims on the armour in places with bolts ontop.��Industrial and yet simple. This post was last modified: 05-28-2007 12:41 PM by Grimstonefire. Also, it's easier than freehand. I like the idea of dwarf remnants adorning them, but what did you think of the beard cloak for the commander? This post was last modified: 05-29-2007 10:35 PM by Xander. 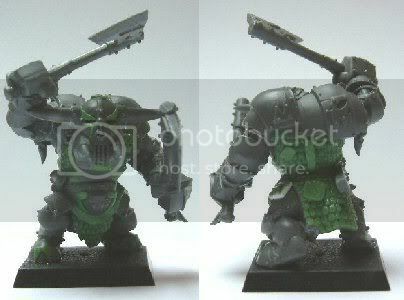 I like the what you did with the BLORK, makes him look richer and more CD influence taste on armor. And BLORKS would work for CD, remember that Orcs have a pretty bad time remembering any really major events. I like the beard cloak idea. That's what I would do if I were trying to intimidate an opponent with a facial hair obsession. In fact the High Elves have the Cloak of Beards magic item, so I can't see why anyone else wouldn't have had the same idea. Are Orcs not fungi, rather than plants? Cool use of extra armor, and i think the cloak idea sounds like a keeper. It wouldn't work for Black orcs, but to them my slave units into my army, the champions (if i give them champions, probably not, but ill make one anyway) will be CDs with whips, egging them on. You could work out something along these lines, but black orcs are kinda ina league of their own. I reckon Blorc's in Chaos Dwarf armies would be mercenaries rather than slaves, so a slavedriver might not work in a unit of them, but for other units it is an awesome idea. Plants and fungi are both seperate kingdoms of organisms (sorry, I'll stop being pedantic in a minute), as are animals, bacteria and protoctista.